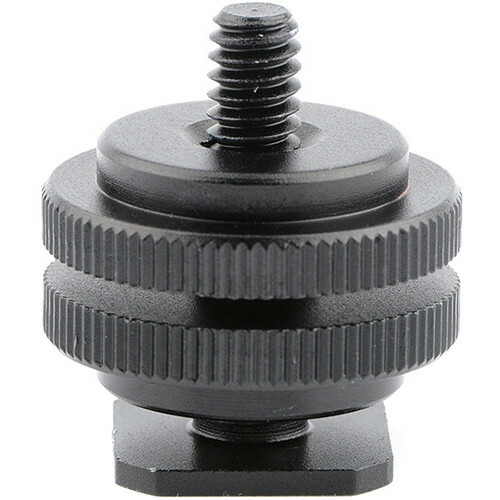 The CAMVATE 1/4"-20 Male Thread to Hot Shoe Adapter enables you to mount a small video or photo accessory, such as a microphone, video light, or a shoe mount flash, and place it on a video rig cold shoe or a cameras hot shoe. The adapter's post starts off with a 1/4"-20 male thread and converts into a 3/8"-16 thread as you go lower. The two adjustable nuts travel along the post, so the knurled discs create a tight fit and lock the accessory into place. Box Dimensions (LxWxH) 2.0 x 1.2 x 1.2"